The Crop Trust has launched the second phase of #CropsInColor, an image-led storytelling campaign that celebrates crop diversity around the world. 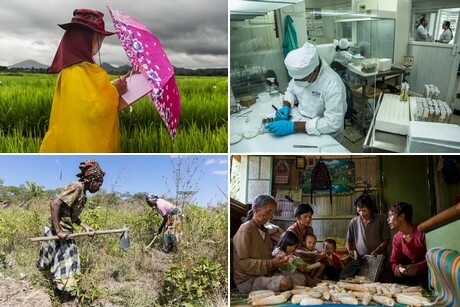 Phase II, sponsored by Corteva Agriscience, the Agriculture Division of DowDuPont will send photographers to Africa, Asia, Europe and the Americas to highlight the distinct roles that food crops play in people’s lives. Featuring ten different crops, including apples, beans, carrots, chili peppers, quinoa and more, #CropsInColor will explore the connection between people and their plates in 13 countries. “The diversity of our food crops is central to our lives and helps define cuisines, cultures, landscapes and more,” said Marie Haga, Executive Director of the Crop Trust. #CropsInColor celebrates both the critical importance of crop diversity and its beauty and cultural relevance across different landscapes. With compelling images, unique narratives and video-interviews, the campaign showcases the wonders of crop diversity and what it means to different communities around the world. To most people, a bag of rice is just a bag of rice. But it is also so much more. In fact, there are thousands of varieties of rice in the world – each variety containing valuable traits, which could help strengthen the basis of our food system. Some of these varieties also hold special value to the farmers which cultivate them and to the people who consume them globally. This is true of every crop that exists in the world. There are almost 1,000 varieties of banana; more than 4,000 varieties of potatoes; no less than 7,000 different types of tomatoes; and an estimated 40,000 varieties of bean – each with their own unique characteristics. Phase II of #CropsInColor will be a sensory campaign, exciting the taste buds, and taking our audience on an exploratory journey from seed bank to table, discovering the unique textures, smells and tastes of ten crops along the way.